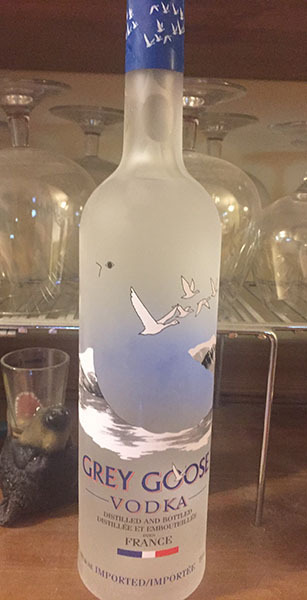 In the fine European tradition of France comes a vodka of uncommon brilliance. 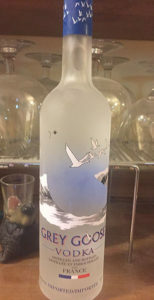 Grey Goose Vodka is distilled from French wheat and is made with springwater from Gensac-la-Pallue that is filtered through limestone. The Expertise of the Maitre de Chai ensures an unparralled smoothness and exceptional taste. I pulled this straight from the freezer and poured us each a shot (after struggling with the cork top that looks like a twist top for a few minutes). I’ve never had much vodka outside of mixed drinks so wasn’t really sure what to expect. Katie kept saying Pastrami! or something at me, some kind of official Russian toast when drinking vodka. I was trying to smell it so I could write some notes on the nose, but she was anxious to dig in so I Pastrami’d her back and took a sip. I’m not sure if I’ve ever tasted anything that didn’t have as much taste as this didn’t have. There isn’t any smell either, just a hint of alcohol, almost medicinal in quality. If I had to describe it, I’d say it tasted like a green apple, fresh from being rinsed in cold water, where you take a big bite, and it goes *crunch* and juices in your mouth. Pretty much like that, but pretend it doesn’t taste like apple, and it’s just clear tasteless juicyness. I warmed it up in my mouth and only got the flavour of alcohol. It doesn’t leave any aftertaste either, just clean all the way around. No burn in the mouth, but a slight warmth and burn in the very back of the throat. Pfft. It’s Na Zdorovie! Hrmph, so much for toasting with you!